Chapters From My Life: What Is Life Without Love, Adventure and Miracle To Brighten It? What Is Life Without Love, Adventure and Miracle To Brighten It? When we think of love usually a picture of beautiful young girl and a handsome young boy looking deeply into each other’s eyes comes into our mind. This is the stereotype image we have of love. People often tend to forget that love can be found in many other forms. We have known people who love their pets, plants and even inanimate objects like computer, car, camera or even a pillow. One of the most amazing loves I have seen in my life is the one shared between my Mom and her friend from NYC. 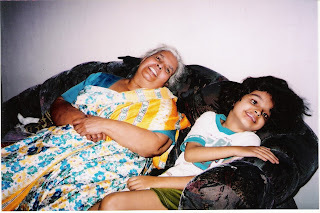 My Mom had not been outside Karnataka, other than a few visits to Puttaparti and Mumbai. She was not highly educated person and did not speak many languages. Obviously she could not speak English. When Heidi King visited Whitefield, she was a young and extremely beautiful young lady. I was child then and recall that she was alone and had come seeking spiritual enlightenment in India. Somehow my Mom and Heidi got connected; even with the language barrier they made arrangements that Heidi would stay at our home in a room, and would pay a small rent towards food and accommodation. It was going to be big makeover for my mom to cook the food which could suite the palate of NYC lady. 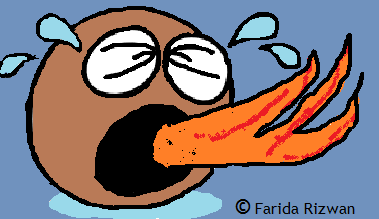 Coming from coastal Karnataka region my Mom used to cook very spicy food which was too hot even for me. I can well imagine the shock Heidi would have got if she ever tried to taste our regular curry. My Mom was a good cook, good in sense she cooked food the way people wanted it. Thus, within days she was preparing finger licking dishes for Heidi. She stayed in India for few months. During her stay Heidi developed a very strong bond of love with my Mom. Once, while cooking food, my mom burnt her hand because she did not hold the rag cloth properly. Heidi went ahead to buy a metal pot holder for my Mom that day and told her to be careful. My Mom must have burnt her hand innumerable times while cooking, and no one had ever bothered to care about it. That simple act from Heidi touched my Mom’s heart very deeply. Here was a woman who was from other part of globe but could feel her simple pain. They both used to communicate without language; I can say that because none was well versed in sign language either. After her stay was over, Heidi said bye to us and went back to NYC. My Mom seldom used the tool Heidi bought her, but we had it in our kitchen as long as I was there and may be my sister-in-law still uses it. Once in a while, when cooking, my Mom would look at the pot holder and speak about the friend she had, who connected with her without words. Heidi came back to India again, this time with her parents. My Mom’s joy knew no bounds. I remember we had five to six Americans enjoying the food my Mom cooked for them back then. Heidi was the first person I had seen with a camera. It was not usual for people to click photos in those times. We had few precious pictures brought back to us by Heidi. She also bought me my first set of sketch pens. Heidi had visited our native village Byndoor too. Being a great artist she had sketched wonderful paintings of our village. She went back to NYC after few months. In hectic schedule of life, we eventually lost touch with her. Initially there were mails exchanged, but then we kept changing our address and finally we lost contact with her. She was always there in my Mom’s memory though. 25 or so years went by. My Mom would fondly think about her and regret that we forgot to keep her address safely. 2000 was the era of computers and internet in my life. One day I decided to give my Mom a surprise. I tried searching for Heidi King, NYC in yahoo search. Those were the days when I did not know much about google. Yahoo was my internet world. It threw too many Heidi’s at me. I did not know which one to pick to start with. Someone mentioned to look in white pages of excite.com. I tried it, there were lots of Heidi’s there but the number had come down. I took the numbers of top ten and went back home. I kept calling one Heidi a day, for a week. I would ask a simple question, “Have you been to India?” Lucky for me, most of them were polite in their answers. Finally on day seven I hit gold. I had found my Moms friend after nearly 25 years. Tears of joy were streaming down my Mom’s face as she spoke in her broken English. Heidi had married and settled quite late in her life. 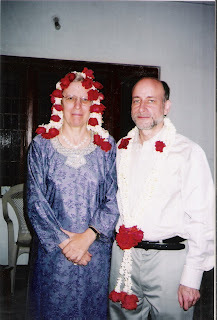 Consequently, after few phone calls and connections, she and her amazing husband David, visited India once again. My Mom and Dad were so glad to welcome the couple. They had fun and some 'not so good adventures' during their stay. To top it all, they could attend the wedding of my brother and also sister which took place on the same day. Heidi again captured some memorable photographs with her digital camera this time around. Heidi and David had lots of fun in the wedding. Though we had professional photographers clicking pictures, it was Heidi who captured the most memorable picture of all with her camera. 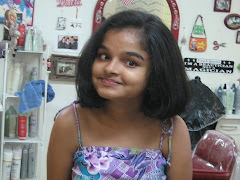 It was the picture of Mom and Farheena laughing heartily. Now that I have lost my Mom, the picture she captured means a treasure to me. 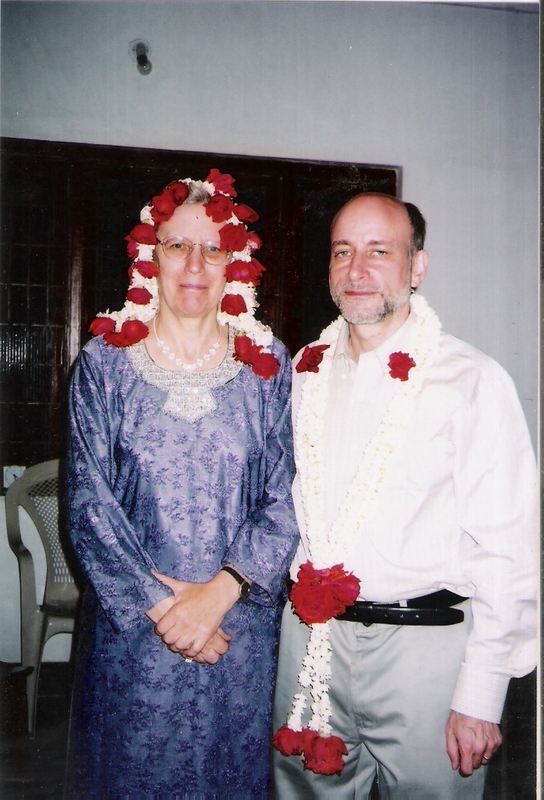 Heidi and David decided to visit Mysore when they were in India. We could have accompanied them, but there were lots of things to attend to in our family due the dual wedding; hence, my brother arranged a good driver(?) and taxi for them to visit few places on way to Mysore. Heidi, though a New Yorker is very mild and humble person. I cannot imagine her ever watching a violent movie or hearing loud music. She is very soft spoken and simple person and same could be said about David too. After they left, I went over to cool corner in Rajarajeshwari Nagar, to have our favorite snacks with my son and daughter. It was our coolest joint, which we had been missing. As I was about to eat my ‘masala puri’, I received a phone call on my cell phone from an unknown number. I hesitated, but picked it up to check who was calling. A man on the other side spoke in a gruff voice, very rudely too, “Do you know these foreigners named Heidi and David?” The plate of masala puri almost fell down from my hand, I stammered, “Yes, what happened to them?” The man on the other side asked again, “Do you know them properly?” I was almost shivering now. I tried to answer him in as calm voice as possible that I knew them from my childhood. There was a pause and then I heard Heidi’s feeble voice, “Oh Farida, we are in trouble”. Aghast I asked, “Where are you?” Her answer shocked me, “We are in police station”. She was so scared and tired that she could not tell me anything more. The person who spoke to me earlier was the inspector. He spoke again and told me that, the driver had sponged off money from Heidi and David, had taken in lots of alcohol, and after being drunk had hit an auto rickshaw. People gathered and tried to stop the car; he did not bother to care where he was going, but tried to escape. The infuriated mob had opened the door but he tried to speed up again and drove with a man hanging on the door of the car. There were some plain clothed policemen there who stopped him finally and took the car to the police station. Heidi later told me that they did not know the people in plain clothes were policemen, and was very scared that they had been captured by some dacoits. I explained to the inspector that these people were quite safe and they could contact me anytime for assurance. I could swear on the fact that they were safe people. He asked me few more questions and then guaranteed that Heidi and David would be safe. They were sent off by another taxi to Mysore by the police. I cannot even imagine the horror the couple must have gone through when such turbulence took place. They are quite mild and very sensitive people who speak almost in whisper. The taxi owner suffered a great loss because the police seized his vehicle. The driver had been nasty again and tried to escape from the toilet of the police station. What a drama! After David's stint with severe diarrhea in Mysore, things started getting calm. They both loved the city of Mysore and clicked pictures of the city with their camera to share with their friends in NYC. Whew! I was glad they were safe. All’s well that ends well. Sure that was an adventure to remember. I had some lengthy chat sessions with Heidi while I was in Bangalore. During one of our discussion, she mentioned to me that I should start writing, because I had good way of narrating incidents. She is responsible for my blogging in a way. The time came when we had to say goodbye to Heidi and David and come to Byndoor. They were supposed to stay for some more days in Bangalore before leaving for NYC. It was sad saying goodbye to them, because it was kind of final good bye for us. 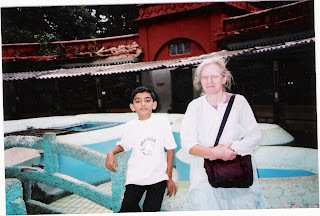 I could not imagine her coming back to India again or we going to visit her. Both Heidi and David had impressed me immensely with their knowledge and simplicity. I learned the truth about Alchemy from David and that is one thing I will always remember him by. Soon after Heidi's visit, my mom was diagnosed with breast cancer. She could not survive it for more than two years. I was glad that she got to meet her dear friend Heidi before saying good bye to all of us. I was devastated when my Mom was diagnosed with BC, as she was the third person from our family with that diagnosis. My sister had lost her battle earlier and I was surviving under fear. I needed support and got in touch with other survivors. Most of the people who connected with me were from USA. By lending and taking support with other survivors, I got very close to few of my friends. The bond we shared grew stronger when I lost my mom in 2006. I needed someone to lean on for support and my friends were there with their weary but strong, supportive shoulders all the time. One fine day I decided that I should meet them. It was a dream, because a trip to USA meant a lot of hurdles and lot of money too. I was not very well off; I lived in a tiny village, in a small home without TV, Washing machine and running water. The only gadget I insisted on having was, computer and internet, for the sake of my sanity. My friend Paula asked me to believe in miracles. I did and the miracle finally did happen. I managed to get visa and travel to USA with my kids; sacrificing the repairs of my home in the process. We spent the four best months of our lives with our friends there. On our way back Judy had arranged for us to watch the fireworks on 4th of July from her apartment in Philadelphia. Wow! We had a great view and loved the show. Finally, before saying bye to USA and coming back to India we spent two days with Heidi and David in NYC. Heidi prepared a wonderful dinner for us before we left. As we sat there eating together, it occurred to us how amazing it was. 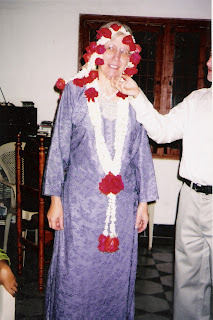 30 years ago Heidi had brought her family to India and my Mom had cooked meals for them. No one would have ever imagined in their wildest dream back then, that I would be visiting Heidi in NYC and she would cook for me and my kids. I felt as though my mom was there with me at the moment and was sharing the dinner with all of us. I could almost sense her presence. It was one of the most amazing events of my life which is nothing short of a miracle. Heidi showed me some amazing pictures she had captured of our family in India with her camera. Unfortunately, she had just single copies of them. She promised to send them to me as soon as possible and she kept her word. To this day, I consider her gift to be a final connection I have with my Mom. Thank you Heidi. 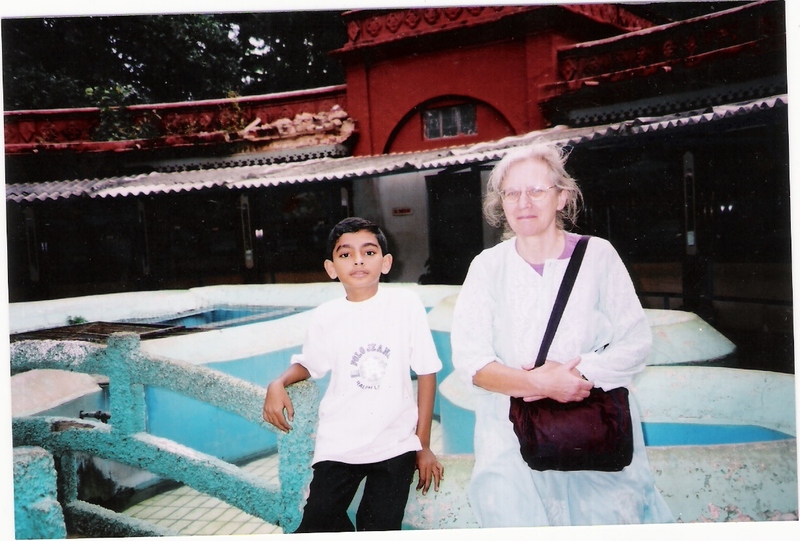 Heidi with Rayyan in Bangalore. PS: Twilight and NYC aerial view photo source Google images. wonderfully composed and narrated, good sequence! 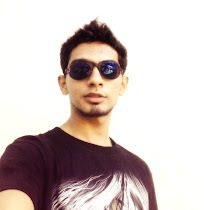 I could visualize the whole story , a very good narration.Gr8, you have winning a lot in the past few days and yup, this time too I think you would brag the gift from blogadda. this is one of the best posts i have read so far. waiting for ur next post. btw how many prizes have u won. wow!!!! Loved reading this Farila..Like you said love can have many manifestations. And I believe God conspires to make us meet people who bring joy. now that is a lovely post.. all the best for the contest ..